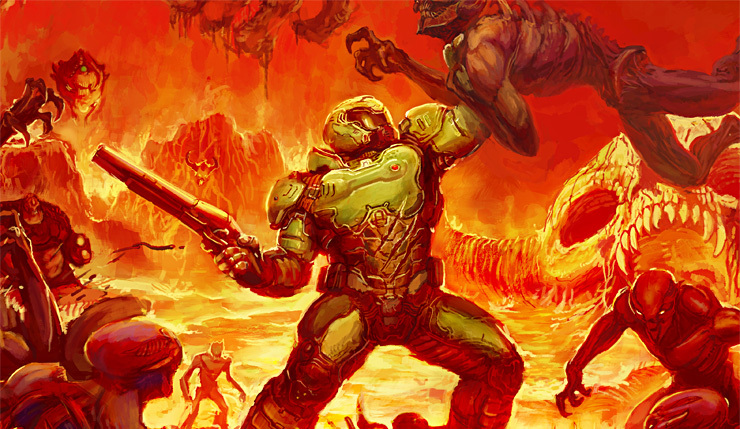 After a long spell away of the spotlight, the Doom franchise is on a bit of a hot streak – the 2016 Doom reboot was a hit and may be getting a sequel, and now it seems a new Doom movie is in the works. This news comes courtesy of singer/actress Nina Bergman, who posted this on Twitter. Just to clear up any possible confusion, Bergman confirmed the movie is, in fact, based on the Doom video game franchise, and that it has a better script than the 2004 Dwayne Johnson film. Take that, Rocky! What else do we know about this new Doom movie? Not a whole lot! Universal hasn’t officially announced the movie yet, and, aside from Bergman, we don’t know any of the cast. In a later tweet, Bergman does seem to hint that Tony Giglio is the film’s director. So, why have we heard so little about this video game movie coming from a major studio? Well, based on the fact that Bergman and Giglio’s IMDB credits are mostly low-budget action and genre flicks and filming is taking place in Bulgaria, it seems likely the new Doom might be a direct-to-DVD/video-on-demand type of deal. Perhaps it will be a Netflix/Amazon/other random streaming service exclusive? Whatever form it takes, I’m up for another Doom flick. Despite the dismal reviews, I actually kind of liked the Rock’s Doom. Yeah, it was dumb, but it had its goofy B-movie appeal. As long as the new movie doesn’t take itself too seriously, it could be a worthwhile Saturday afternoon stream. What about you folks? Any interest in another Doom movie? Or should the franchise stick to games?